Stromboli is an Italian wrap sandwich, starting with our homemade pizza crust, wrapped around fresh ingredients, then brushed with garlic butter and special seasonings and baked in the oven. 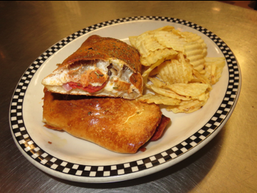 The Stromboli is served with chips or substitute a cup of soup or chili for $1.49. Roast beef, onions, green peppers, and mozzarella cheese. Served with Parmesan dressing. Ham, turkey, pepperoni, salami, tomatoes, and mozzarella cheese. Turkey, bacon and mozzarella cheese, served with ranch dressing. Choice of 3 sub toppings and mozzarella cheese, then wrapped into a Stromboli.